The Econoline Garrison Belt from DeSantis is a tough, professional-looking option at a budget-friendly price. It is made from hard-wearing bonded leather and is available in a plain or a basketweave finish. 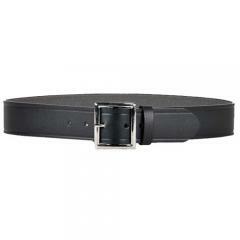 The simple, classic design ensures the belt is an ideal choice for office or duty wear. The Econoline comes with a leather-like, wear-resistant finish. It measures 1.75-inches wide, guaranteeing compatibility with a wide range of duty gear accessories from DeSantis and other manufacturers. Nickel, brass and plain black center-bar square buckles are available to complete a more customized look matching personal preference or department specifications. Nice belt I use it with by BDUs on some duty days.